Lock in a great price for HI - Arad Hostel – rated 8.4 by recent guests! The staff was super nice and helpful. There is also free parking on the hostel grounds which are guarded at night. Great location, Excellent breakfast, Friendly Staff. Overall, this was an excellent stay. We really enjoyed it. Best shower in Israel. Almost painful it was so good. We stayed one night only. Room was super clean, it had everything we needed. Beautiful grounds. Highly recommended. The receptionist was great. Good advice and very friendly. Single bed room is a little house. Everything available, which could be needed. Friendly and helpful staff. Breakfast good. This hostel surely usually is well worth it's price. Rooms are well equipped and clean. The whole compound feels well maintained and modern. simple and clean. exactly what we needed after a day travelling the area. Set in Arad in the Negev Desert, HI - Arad Hostel offers modern rooms and dormitories, all with air conditioning, cable TV and free Wi-Fi. It is just a few steps from Arad Central Bus Station. HI - Arad features luggage storage. An Israeli breakfast is served each morning and drinks and snacks are available from the vending machines. The hostel has a quiet location surrounded by greenery. It is ideal for visiting the craters of the Negev Desert and the Yorke'am springs. The historic fortress of Masada is also nearby and the thermal spas of Ein Bokek on the Dead Sea are 20 minutes away by car. When would you like to stay at HI - Arad Hostel? This air-conditioned room features cable TV and free Wi-Fi. The dormitory is air conditioned and features cable TV and free Wi-Fi. 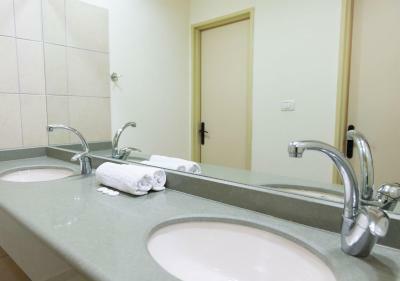 You share a bathroom with shower with other guests in the dormitory. House Rules HI - Arad Hostel takes special requests – add in the next step! HI - Arad Hostel accepts these cards and reserves the right to temporarily hold an amount prior to arrival. We had a small guest house as our room and the standard was quite low. There were ants in the shower and at first the heating did not work. Also breakfast was at very early hours. Bed is a little bit small. Upon checking in we were notified about 200 school-kids spending the night and that we should expect "some" noise. What an understatement. It was pure chaos and sounded like a schools lunch break right next to our bed. I understand kids may be loud and I'm totally okay with that. However, staff should somehow at least try to make the stay worth for all the other guests. Instead all staff left for the night. We couldn't sleep till 11pm. There were obviously no rules for anyone that night, none of the staff felt the need to control the chaos. Even worse, what the kitchen staff forgot about us the next morning and closed the dining hall early, after 200 kids left. We got leftovers and no drinks as we asked for our paid breakfast. As mentioned above, I'm sure this hostel usually is nice and quiet, just as advertised. Clean. Room big. Close to masada. very poor restaurant availability in the area after 20:00.